The discovery of a gene family encoding Olfactory Receptors (ORs) has paved the way for a better understanding of the molecular mechanisms of odor perception. In mammals, this family represents the largest cohort of genes (3% of the whole genome), resulting in the biggest family of receptors dedicated to olfaction (although recent literature demonstrates that ORs, expressed in non-olfactory tissues, might have other functions). Activated ORs are the initial players in a signal transduction cascade which ultimately produces a nerve impulse that is transmitted to the brain. Rather than binding specific ligands, ORs display affinity for a range of odor compounds, and conversely a single odorant compound may bind to several olfactory receptors with varying affinities which depend on the physical and chemical properties of compounds. 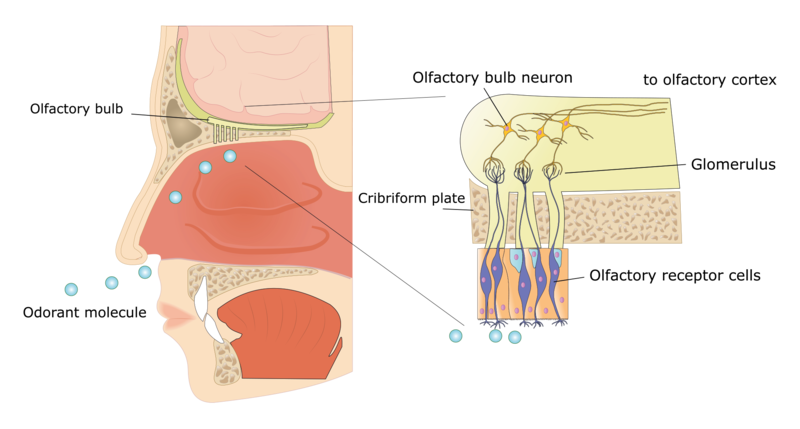 Once the odorant has bound to the ORs, the receptor undergoes structural changes and activates a cascade of reactions in the cell which ultimately carries the information to the brain. Olfaction is an important part of taste perception as it is responsible for approximately 70% of flavor perception.